Mogoșoaia Palace (in Romanian: Palatul Mogoșoaia, pronounced [paˈlatul moɡoˈʃo̯aja]) is situated about 10 kilometres from Bucharest, Romania. It was built between 1698-1702 by Constantin Brâncoveanu in what is called the Romanian Renaissance style or Brâncovenesc style. The palace bears the name of the widow of the Romanian boyar Mogoș, who owned the land it was built on. After 1714, when Constantin Brancoveanu was executed with his entire family in Constantinople, all the family's wealth was confiscated by the Ottomans and the palace was converted into an inn. Rebought by Prince Stefan Cantacuzino, he returned it to Brâncoveanu's grandson Constantin, and remained with the family until the early nineteenth century. The palace was devastated by the Ottomans during the Russo-Turkish War of 1768-1774. Granted by prince Grigore to his daughter, Zoe Mavrocordat who had married George D. Bibescu, sovereign Prince of Wallachia. The palace remained within Bibescu family and was renovated by Nicolae Bibescu. In November 1916, the palace at Mogosoaia was bombed by the German air forces. Bought from Marie-Nicole by her cousin (and head of the Princely house), Prince George Bibesco, the Palace was given to his wife, Princess Martha. He later deeded the land to her, too. Martha spent her private fortune for the reconstruction. In the late 1920s and the 1930s, the palace became the meeting place for politicians and for the international high society. When Prince George died in 1941, he was buried in the small, white 1688 church on the grounds of the Palace. 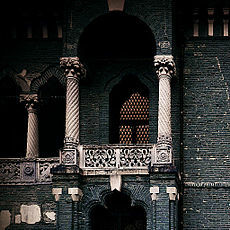 In 2008, the Romanian gothic rock band Inopia produced a video of their song "Epitaph", filmed entirely at Mogosoaia. The long medievalist composition is based on Elizabeth Bibesco's epitaph. In 2010 the Balkan Go Championship took place at Mogoșoaia, being broadcast by EuroGoTV to hundreds of fans watching the stream and following the games on the KGS Go Server. Wikimedia Commons has media related to Mogoșoaia Palace. This page was last edited on 30 December 2018, at 12:22 (UTC).